The man behind the biggest UK single of the year — 'Pass Out' by Tinie Tempah — is 21‑year‑old musical prodigy and maverick Labrinth. Based in a studio in London's Wood Green, for the past year Labrinth (real name Timothy McKenzie) has been writing and producing tracks for the cream of the UK's pop and urban scene, including Tinie Tempah, Professor Green, Pixie Lott, JLS, Ms Dynamite, Bluey Robinson, Master Shortie, Tinchy Stryder, Ellie Goulding and many others. Labrinth is also about to step into the limelight in his own right with the forthcoming release of his debut single as a solo artist, 'Let The Sunshine'. Photo: Laurie FletcherHackney‑born Labrinth comes from a large and gifted musical family. His brother Josh plays drums for Natasha and Daniel Bedingfield, and his sister Sherelle has done vocal sessions for Guy Chambers. Like so many talented musicians before him, Labrinth's early musical influences came from the church. "When I was growing up in Hackney my family were very religious. We listened mostly to gospel and we weren't allowed to listen to secular music. We were listening to a lot of the greats like Kim Burrell, Kirk Franklin and stuff like that. Gospel takes from a lot of different things: funk, soul, blues and jazz. Growing up with that was a big influence — it wasn't like we were studying gospel but more like we were inspiring each other. My brother played bass and I would watch him and want to do what he did, whether he was doing slap bass or whatever — it wasn't competitive but you wanted to be like your peers. "It was like a big friendship, with nine siblings singing, harmonising and developing — it wasn't like studying music in school, it was like pure love. That's how I got good at harmonies, learning them for the next church conference. Very early on through the church I knew about soprano, alto, tenor, bass and what parts they played, without fully being taught the theory — it was just someone going, 'Altos, where are you?' It was learning by ear and you just caught on. "Later I studied music theory for four years and tried to break it down. It fascinated me how chord progressions work, but a lot of the musicians from church don't know theory — they just play by ear and their licks are from memory. Before, I just went with what sounds good; now I can think 'Do I want a minor or flattened fifth? Augmented? Diminished?' Knowing the colours these options bring changes everything. 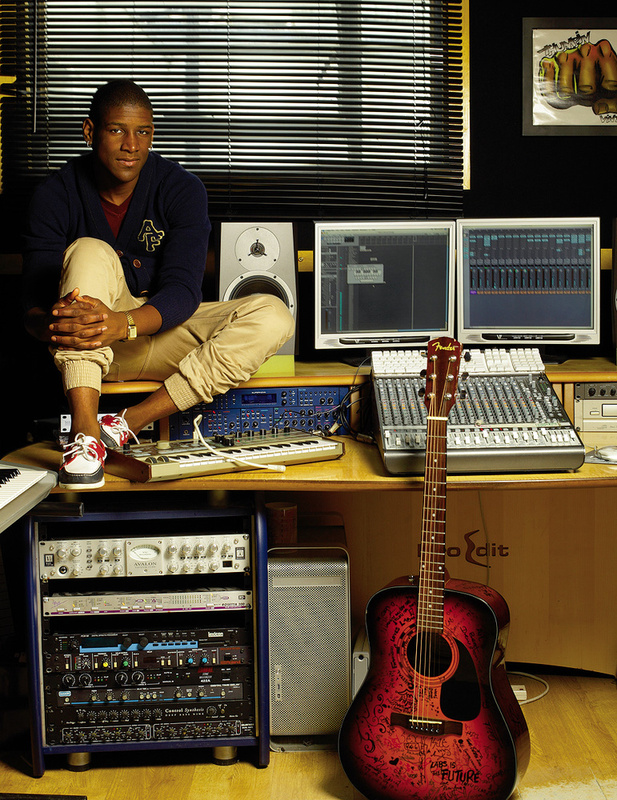 Labrinth's setup is based around an Apple Mac G5 running Logic.By the time he was 15, it was obvious that Labrinth wanted to follow a career in music, and his mother set about looking for a manager and mentor who could guide him through the shark‑infested waters of the music industry. The person she chose was writer/producer Marc Williams, who had enjoyed chart success in the '90s with Three Amigos and A Hippy, A Homeboy and A Funky Dread, and was running a music business course when Labrinth's mother met him. 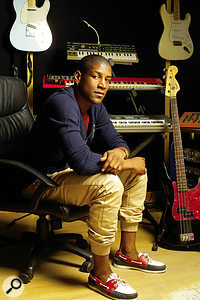 Impressed by a demo tape of Labrinth's material, Williams gave Labrinth a spare set of keys to his recording studio, where he spent most of the next five years. He rarely went home, preferring to sleep on the couch in the studio, working away like a mad professor into the early hours. The turning point for Labrinth came in 2009 when he was signed to a publishing deal with EMI, who arranged the collaboration with Tinie Tempah, spawning the hits 'Pass Out' and 'Frisky'. "EMI thought I had something different, signed me as a writer/producer and started throwing me lots of different artists for me to work with. I spent about a year learning how the music industry works as a writer working to briefs. 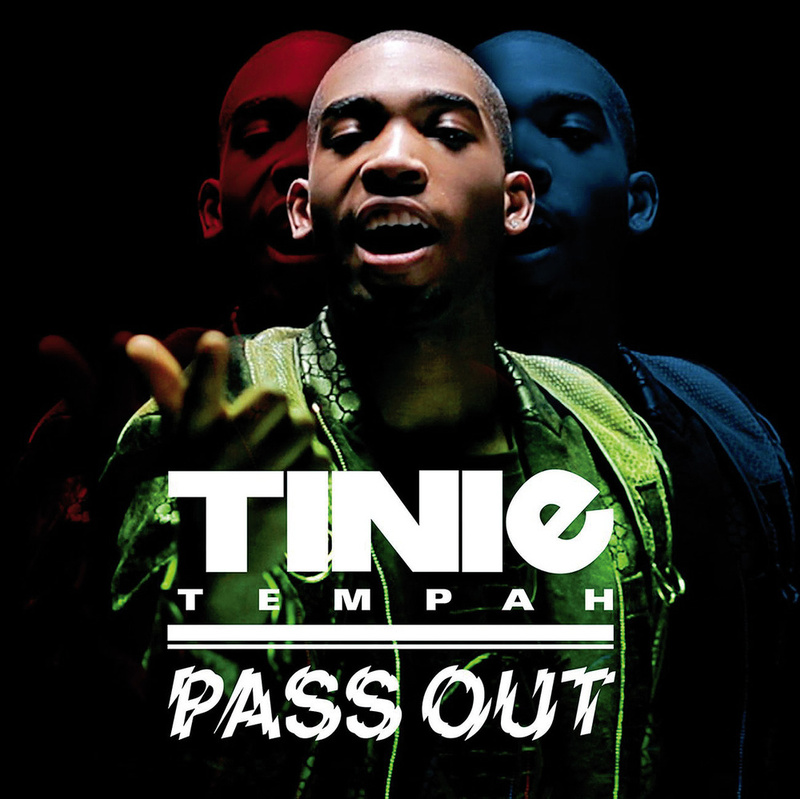 At the end of 2009, I met Tinie Tempah and wrote 'Pass Out'. That was the start of me trying to do my own thing and just trying to be myself. It was weird seeing it go to number one — I've seen people chase number ones for like 10 years, and for that to happen on my first release was extreme. It happened because I said I want to be myself. "Before I met Tinie Tempah there was a brief for what the company wanted — it was a bit of Dizzee Rascal's 'Bonkers' and a bit of Wiley's 'Rolex'. I thought 'Even though they are major tracks, that's not exploring hip‑hop,' so I decided to do my own thing instead and put Tinie behind a totally different sound. "'Pass Out' was originally written when I was writing tracks for Bluey Robinson's album. I was looking for something a bit more up‑tempo than what I'd already created for him. I said to him 'Let's just try to experiment today, and not go for some contrived style, just something that has a vibe.' Out of that I wrote 'Pass Out', but it wasn't perfect for Bluey, it was just something that me and him used for a little dance battle in the studio. Even though it wasn't right for Bluey, I knew it had some energy. "After the success of Tinchy Stryder, labels were looking for rappers and they signed Tinie Tempah. I went onto his MySpace site and I thought he was really good, but I wasn't really into his grime style. One thing I looked at was his flow, and I noticed he was really good at sitting on a beat. When he came down to the studio he said he was looking to try something a little different, a bit weirder than he had done before. That's when I played 'Pass Out'. He said 'That's perfect!' and he left the room. I thought he'd just gone to the toilet but he came back with a whole new style and vibe. It was an amazing moment; I knew something special had happened. While he was doing his verses I added this wild intro. I ended up putting in a reggae section too and turned the song into a crazy banger, man. "The whole song had one bass note and a third above it, almost like trance. The synth sound was a [Korg] Polysix, and I layered in a Nintendo‑style 8‑bit sound on top. I just wanted to use that sound because I love the old Super Nintendo sound and expressing that game vibe. I also used the default sine wave from the Logic EXS24 to create the intro sound, and in the club, that sounds wild. On the drums I like a bit of distortion to get that full sound and some bit‑crusher to keep that 8‑bit vibe. In the reggae section I wanted some of that old‑school way of doing it, and I played it in on a Fender Precision with one of the settings on Amplitube. "Following on from the reggae idea, I wanted a jungle vibe with the drums at the end. The kick drum was from Ultrabeat in Logic (I like their clean subs) and I also used a hip‑hop kick that I made myself that has a nice knock, it's got a bit of a J Dilla vibe on it. Then I had a kind of tight, Dre‑style snare that I put over the top to get a bit of that old‑school hip‑hop feel. 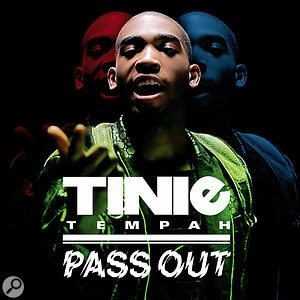 'Pass Out' went straight in at number one in the UK singles charts in April 2010. 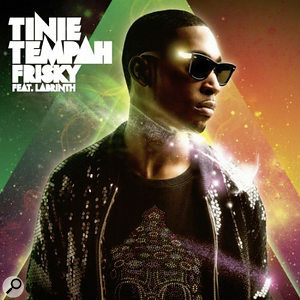 To follow up this single, Labrinth sketched out the track that was to become 'Frisky' on his Apple G4 laptop. 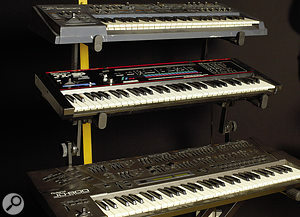 Labrinth can call on a selection of analogue and digital keyboards, including (left, from top) Roland JP8000, JX3P and JD800 and (right) Korg Microkorg, Clavia Nord Lead 2 and Korg Trinity. "With 'Frisky', we went for a similar vibe to 'Pass Out', but this time I just used a bass from my Roland JX3P, an old‑school '80s keyboard. I used the JX3P for the melody, too, and layered it with a sound from the Rob Papen Blue VSTi. "The American voice saying 'Frisky' in the chorus is me. I have this little character that I've created that reminds me of the Parliament records when they used to put in weird little vocal sounds. I made up this guy, I called him Christopher Frisk — he's slowly creating an identity and I've put him on loads of songs that I've done recently — he's on Professor Green's record and some of my solo tracks. He's on a lot of stuff — he's starting to get a bit big‑headed now he's turned into a diva! The 'Frisky' voice is just me pretending to be a 1940s presenter. It's weird, I was actually almost sued for that — a company thought I had stolen the Christopher Frisk voice off a sample CD and they tried to get us for it. So I sent them a Christopher Frisk message saying 'How can I steal my own voice?' It was quite funny, but yeah, I'm creative with my voice. I like to try out lots of new things with it. "'Frisky' and 'Pass Out' were about young, wild, urban kids in the UK club scene. There's a bit of dubstep, drum & bass, hip‑hop and R&B. What I call my sound is a musi‑graph. It's me taking pictures of what I see around me. Music is the sound of your life — the sounds I use are what I experience around me. 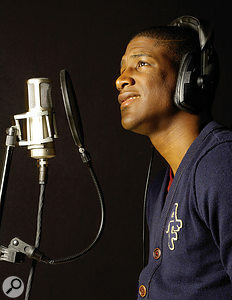 'Frisky' followed 'Pass Out' into the UK charts, peaking at number two, and by June 2010 Labrinth was at the centre of a bidding war between all the major record labels. Right at the last minute, Simon Cowell's company Syco stepped in with the winning bid. Labrinth is the first artist the label has signed apart from talent‑show winners, and on the face of it, the pairing of X‑Factor mogul and underground urban producer seems unlikely. So what was it that made them go for the deal? "There was an irony in signing to Syco, which is a world away from my background and my friends' and family's backgrounds in soul and gospel, but Simon has a great business head. He's not afraid to go against what everyone else is doing. This is a big move for Syco as much as it is for us. I thought 'What's the point of being with a label that has already got similar acts to me?' I like the idea of being on a label where I stand out from the other acts. I've been backstage at the X‑factor auditions, but we're not really involved in that process. I'm not going to become a judge — I'm not the next Simon. Another sweetener to the Syco deal was that they agreed to fund Labrinth's own label, Oddchild. "Oddchild was an idea that both I and my manager had. We decided to create a label to nurture new talent and give them guidance. Syco have given us creative control — they have a say in it, but the last word is mine. This is because they believe in me and they've seen the work that I can deliver. In both Tinie Tempah singles, Labrinth shone on the lead vocals in the choruses — a fact that didn't go unnoticed by the labels that were chasing him for his signature. He was persuaded out of the studio to front his own solo album. The first single from this album is a sensitive and reflective but joyous anthem called 'Let The Sunshine'. "I was an artist before I was producing. I used to rap and sing, and got into producing because I needed some backing for my raps. The record companies who were bidding on me as a producer heard all the tracks that I had sung on to sell to other artists, and they loved them and thought I'd be the perfect artist to sing them. It was almost like I'd forgotten about my artist side while I was producing, but who better to perform the music than the person who created it? I have a slightly different approach to my solo tracks than the tracks I write for other people. When I'm working with other people it's like I'm a tailor and I'm dressing the tracks in their emotions rather than mine. Often with Labrinth's productions it's the things that he chooses to leave out as much as the choice of sounds that mark out his sonic style. Hi‑hats and other cymbals are noticeable by their absence in 'Let The Sunshine'. To keep the momentum of the track going, Marc Williams added some extra touches to the mix by layering in gated and filtered white noise using Logic's ES2 synth. 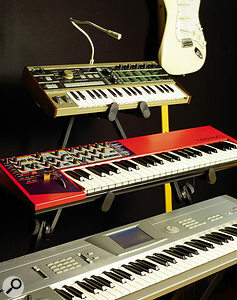 The main synth line is a layer of three synths: the JX3P, the white noise from the ES2 and a Nord Lead. The minimalist bass line is a real Fender Precision, distorted and layered with a Nord lead. 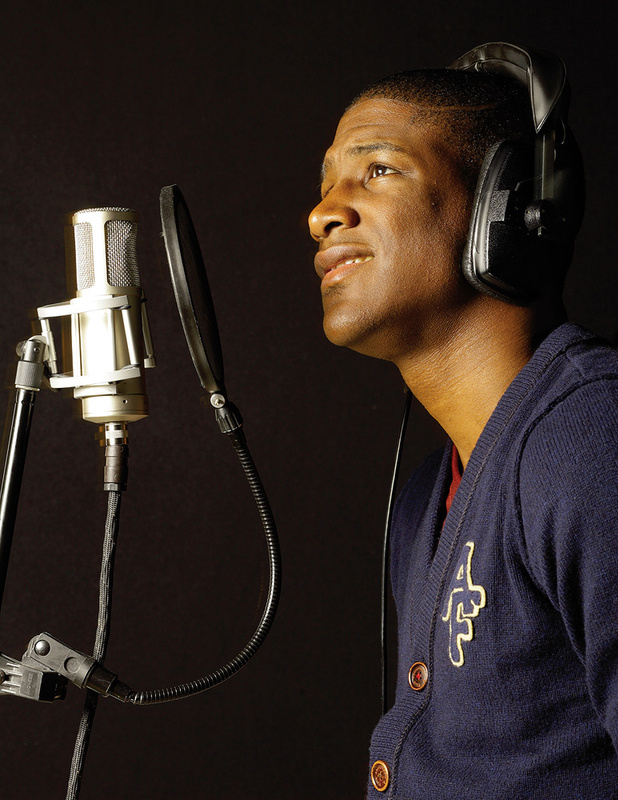 Despite the heavy workload of running a label and developing his solo work, Labrinth still finds time to write for and produce other artists. Success has brought him a new‑found freedom in this work. "When the companies used to send artists to me, they came with a brief to sound like something that's already out there, but now it's like, 'Lab, just do whatever you want.' Now they trust me because of the success of the records that I've put out. I used to write songs with specific artists in mind but now I think it's better just to spill your heart out. 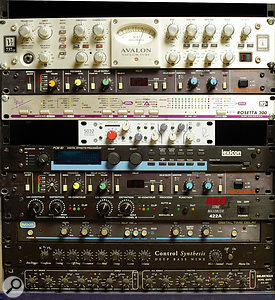 Most audio that is recorded at Labrinth's studio passes through either the Avalon VT737SP voice channel (top) or the Neve Portico 5032 (centre) and into the Apogee Rosetta converter. Other outboard includes two Roland SDE2000 delays, Lexicon PCM80 reverb, BBE 422A Sonic Maximizer, MXR Digital Time Delay, Control Synthesis Deep Bass Nine and Drawmer DS201 gate.When Labrinth works with other artists, he always does so with them in his studio, and has them singing by his side in the control room into a Brauner Valvet mic. 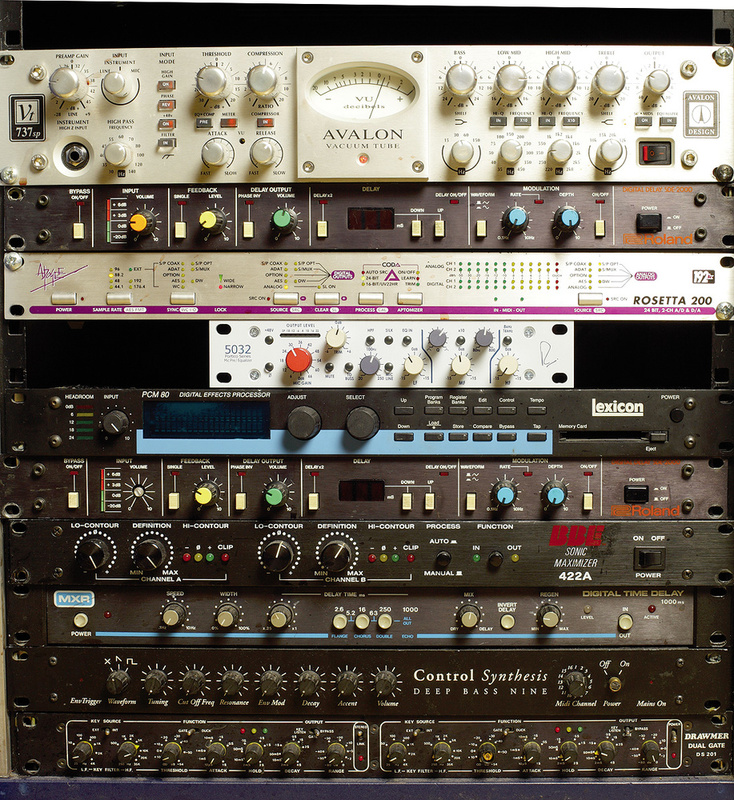 This passes through either an Avalon VT737 or his Neve Portico preamp into an Apogee Rosetta A‑D, then into an Apple G5 running Logic. "I don't like working with artists outside of the studio and just sending them a finished track. I think it's important to have them with you in the studio so you get a vibe. I think the vibe is everything. With 'Frisky', I wrote it one night on my laptop and then sent it over to Tinie with a little sketch of a verse, but he didn't want to write the verses outside of the studio because he knew I'd want to start moving things around later. When I meet an artist for the first time, I usually have at least a selection of eight‑bar loops that they can listen to and see if they want to work on. 'Pass Out' was played as an eight‑bar loop to Tinie Tempah and we built it up from there. So was 'Frisky'. It's usually an eight‑bar idea or three eight‑bar ideas with different drops. "Usually I'm working on about three songs at the same time, but I'll try to keep going to the end, because inspiration can die on you. When you're playing a song over and over, you can lose the original excitement of what inspired you about it in the first place. "When I start a beat it can start from anything — maybe a little bass line melody that I have in my head. With synths, most of the time I use presets but I layer them a lot with other synths and sounds and distort them, or add things like chorus and flanger, so I wouldn't necessarily call them presets. I like a bit of my Albinos [Rob Papen's VST Instrument], Minimoogs, MS20s — I like old vintage keyboards. 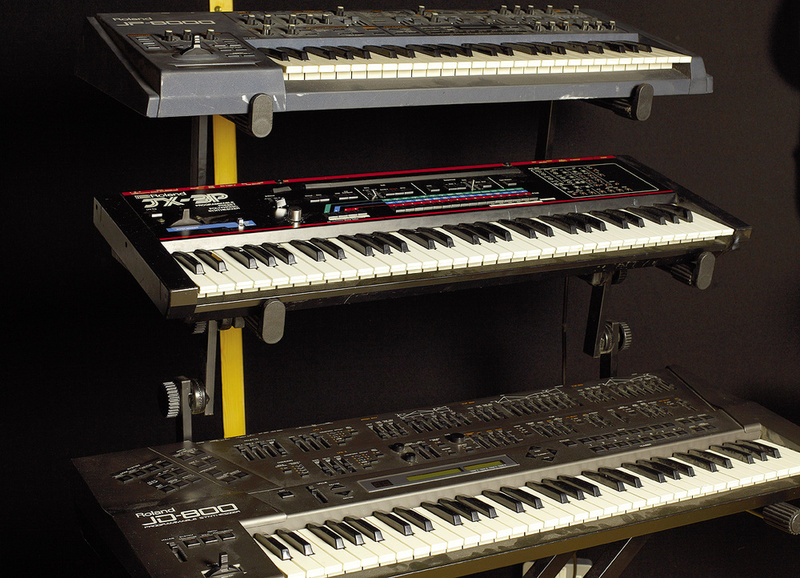 Sometimes I'll use the outboard synths like the Nord Lead or Jupiter and bounce those into audio and process them some more, or just use the synths that come with Logic. It all depends on what I'm trying to create. The future seems bright for Labrinth, with artists from across the world eager to tap into his production and writing skills. Through it all, however, he is determined to pursue an individual vision. Despite his association with the cutting edge of electro music, Labrinth is about to rediscover his "earthy acoustic world”. In a characteristically unusual move, he is about to embark on a series of collaborations with country artists and writers in Nashville.